I’ve had a lot of garage sales over the last 15 years but none as successful as the last two. We made over $1000 each time and are gearing up for another one soon. Here’s a few tips that I believe helped us get there. 1. As I organize and get rid of clutter, I add all the unneeded items to boxes labeled ‘garage sale’ knowing that we will probably have enough accumulated by the following spring for a garage sale. 2. For a month or two before your sale, save paper and plastic shopping bags to use for shoppers that purchase multiple items. 3. 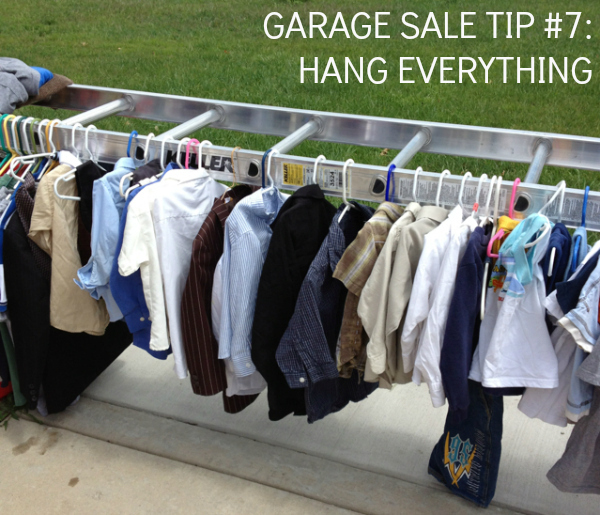 We have always lived in centrally located neighborhoods making it easy to hold a garage sale. 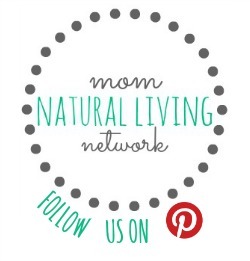 If you don’t, you may find a family member or friend that wants to join you to host at their centrally located house. The more traffic nearby, the better. 4. I like to hold our garage sales on a sunny weekend in the late spring right before school gets out because we typically have a lot of moms stopping by while their older children are in school. Find out if your neighborhood or local area has an annual garage sale, it may be worth scheduling your sale then because of the additional traffic. 5. I’ve found Friday to be a FAR better day for a garage sale than Saturday and both are better than a Sunday. We sell 2x as much on Friday as we do on Saturday. In some cities, I understand that Thursday is garage sale day. Either way, ask around to see what weekday is the garage sale day and then follow it up with a second day. 6. We start at 8am and typically stay ‘open’ until 5pm on Friday and then close early on Saturday, around 1 or 2pm, so we can enjoy the weekend. Designate a table for each type of item: kitchen, household, toys, home decor, tools, etc. Clothing : divide by men, women, boys and girls and HANG UP as much as you can. For what you cannot hang, lay out a tarp or blanket and organize the clothing there. 8. Make sure everything you are in selling is in clean and working condition. Wash your clothes and fold them neatly. Wipe down anything dusty. Have batteries or an electrical plugin nearby to show that electronics and toys work. 9. Put all of your big items out by the curb, they will encourage people to stop to see what else you have. 10. Gather all the cheap toys (i.e. Happy Meal toys, Dollar Store stuff) and anything else that you don’t think is worth even a quarter and put it into a box labeled FREE. Sit it on the curb at the front of the sale so anyone driving by can see it. You would be surprised how many people stop just to look in the box. It’s also a great place to keep kids busy while moms are shopping your sale. Price EVERYTHING. People do not want to ask for the price. Make it simple by using these preprinted garage sale stickers and putting up simple signs such as “All books are 50 cents”. People that shop garage sales are looking for a deal. If you’ve never shopped one, you might want to visit several so you can get an idea of pricing in your area. 12. On the last day of your sale, designate the last couple hours to sell everything 1/2 off. If there are a few items you are not willing to go that low on, just put them off to the side. 15. 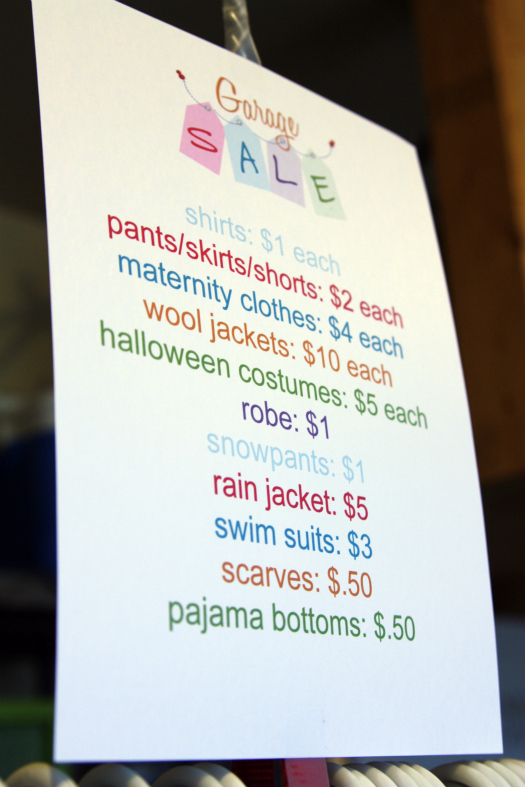 Buy several garage sale signs or brightly colored poster board. Make A LOT of signs and post them at all intersections within a mile of your home. Many people will be driving through your area, see your sign and try to find your sale so make sure your signs lead directly to the sale whether the driver has your address or not. 16. 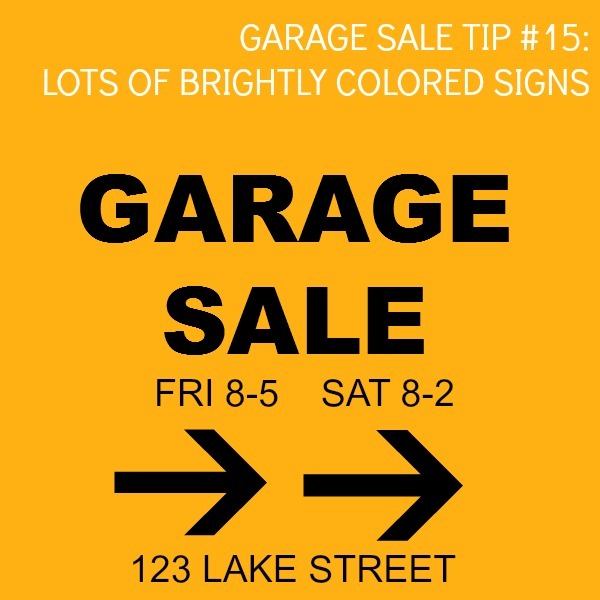 Make sure to use all the same posters (or poster color) so the driver knows they are following the signs to the same garage sale. Use a thick BLACK market and put the DAYS (not dates), times, address and a HUGE ARROW on each sign so the driver can quickly see which direction to head. I personally like these signs because they stand up on their own and I don’t have to find a post to awkwardly hang a sign on. 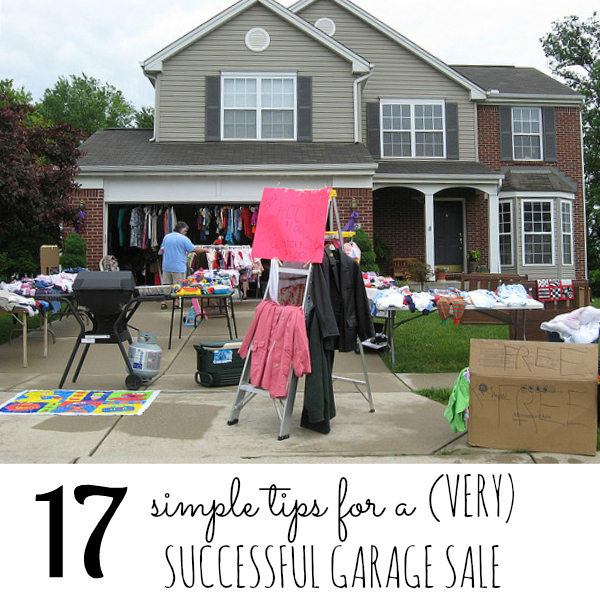 What other tips can you share for a successful garage sale? I had a big yard sale about 5 years ago and have wanted to have another one each spring and fall since. You have helped a lot. I’m also curious to know how you made the ladder rack? Did you simply put the ladder between two sturdy tables? how did you make the ladder rack for the clothes? Great tips! My family and I have a garage sale annually, and I usually make between 2 and 3 thousand. I have had much better luck with folding clothing, and labeling them with size, brand, and price. Several customers have told me how much they appreciate and like that I do so. Also, I always use masking tape because it never falls off. The best brand I’ve found is Duck. It can be found at your local Walmart for 96 cents. I only hang coats, costumes, etc. I also organize by size, and post signs in the tables clearly labeling what size can be found there. We use laundry baskets (which can be found at your local Dollar Tree) for customers to use while shopping. We also make sure that every item we sell is clean, has batteries, and is in working condition. Organization is also very important to the success of your sale. Customers really appreciate a sale being clean, neat, and well organized. Advertising is equally as important. I post a detailed ad, with an attention grabbing title (such as “Sale into Summer”or “Spectacular Spring Sale”) in 2 of our local newspapers, as well as on Craig’s List and Facebook. We also use an app called “Garage Sale Checkout” on our iPads for customer checkout. It is very easy to use, and is easy to fix a mistake if made. Always make sure to have plenty of change too. You would be surprised how many customers come with 50’s and 100’s at the start of your sale! If you don’t want customers coming early, I would suggest posting in your ad and outside your sale, “Please no early sales.” Otherwise, you will have customers arriving very early, which can be overwhelming when your trying to finish up last minute details before your sale. We finish up by playing soft music, sweeping the garage, setting up a snack/beverage stand, and hauling large items outside. The first two hours are usually the busiest, so I would suggest having 2 lines if you’re having a fairly large sale. I hope this helps someone out along the way. Great posting! I am a huge garage saler. I kept track one day to see how many I hit on average in May and it was close to a hundred. So here is my take on the buyers look. 1. Have things irganized and neat lookin, small items in sandwhich baggies, 2 pc outfits safety pin together. 2. Will get more money if you have original box or manual. 3. Sit large items out to be seen, I will towards end of day do drive by shopping, getting too tired to get out. 4. Have a candle lit or some kind of air freshner, A pleasant smell will make for longer shopping. 5. Keep prices low, I will cgeck oht first few items to see if high priced. This will determine if I venture any farther. 6. Be ready to deal, if I detect a snooty attitude for me askin if you take less I will most likely not buy anything. I have no problems if I ask and you say no nicely. I understand its Thursday and you just opened. 7. I wont dig through boxes, bend over or squat for items that I am paying a few dollars for. 8. I expect to see it work before I buy it. 9. Kids lemonade stand ir cookie gets me every time 🙂 10. Put the miles you are on your sign. When gas prices were so high, I wouldnt venture off my route if I don’t know how far. Not gonna travel 5 miles in the chance you have nothing I am interested in. Thats 10 miles I have just wasted. 1. Use plastic or paper bags, near end of sale yell out “Buy a bag for $2 & fill it up!” A good way to make a few extra $’s on the last picked over stuff that will be given away anyway. 2. Play a little background music. People don’t feel silent & shy & might get them to hang around & buy! 3. Greet people as they walk up, be friendly & chat if they are really looking at something. Offer a ‘deal’ or explain what the item is. 4. People want to bargain! Be prepared to be flexible. Just set it atop a table on each side.